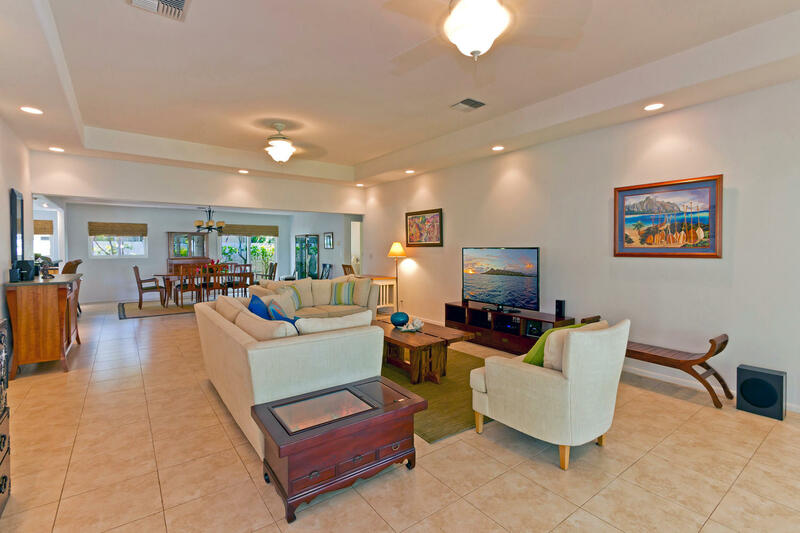 Your stunning Hawaiian Island Style vacation rental with large covered lanai area. 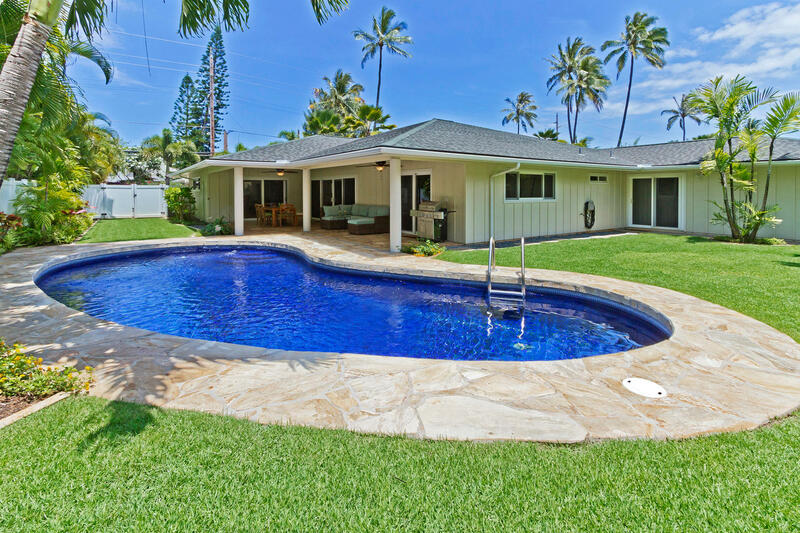 Perfect indoor - outdoor Hawaiian living with private pool to relax and enjoy! Walk across the street to Kailua, Hawaii's white sand beach! This Hawaiian vacation rental has a bright open floor plan. Main home has 4 bedrooms and 3 bathrooms with a large family room, spacious kitchen and formal dining for 10. 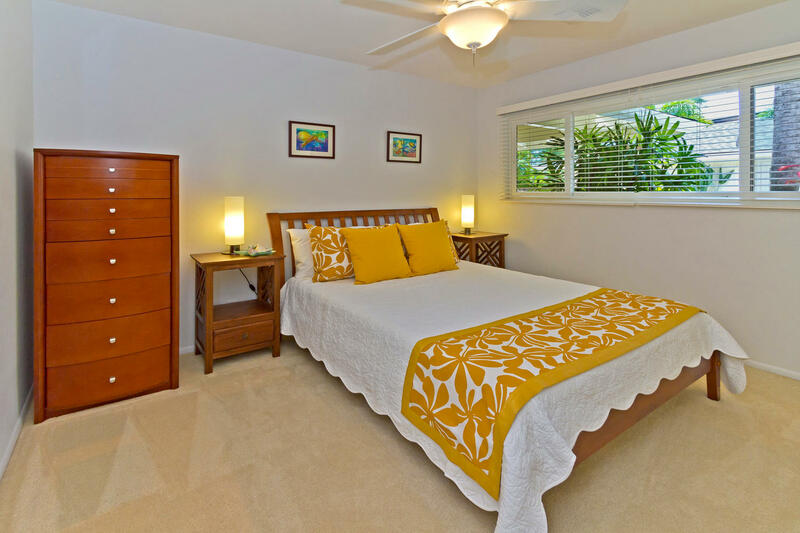 This house presents the perfect setting for a relaxing family vacation right here in the heart of Kailua, world renowned and close to famous Kailua and Lanikai Beaches. Separate studio cottage with private bath and pool access. Main and Guest house will be rented as one unit for your enjoyment. Professionally landscaped, fenced yard, gated lot with 2 car garage, and central a/c throughout this rental home. Elegant furnishings throughout and equipped with all guests could wish for. 2 Twins in the den to the right of the main entry - cannot be made into a king. 6. Please note there is no child safety fence option for around the pool area. All children must be supervised by adult. Pool is not heated. Pool can be cooler in winter months. A fantastic property that works well for large families. The kitchen has plenty of space for groups to cook and has all the equipment. The dinner and living areas are a great size. Bathrooms and bedrooms were perfect and had lovely linens. The pool was amazing, out four you children loved playing in it. The front driveway was wonderful for the children to play on and the property being fully fenced reduced the stress levels of all the parents! Great large house for a big family. Perfect location near the most beautiful beach. 2 minute walk down the street. Nice pool and a bonus cottage on the property. Staff was very accommodating and friendly. Regan made all the early helpful arrangements for us. Great location. We'll go back for another family celebration. 5 out of 5 stars The house was fabulous! The home was much larger than it appeared in the pictures. We loved the spacious design with the additional day beds in the den area--it met our family of 10's needs perfectly. The air conditioning was super-efficient, and we made good use of the large kitchen and bbq. The pool was amazing, and the short one-block walk to the beach was incredible. Convenient location close to Kailua town and Kaneohe for shopping and eating. We've rented several vacation homes in Hawaii, and this, by far, was our favorite. Hale Mahina was absolutely perfect for our vacation. We loved it! 5 out of 5 stars Had 3 couples and kids. The house was perfect. Plenty of space. Dining room and kitchen were perfect for group meals. The house was close enough to the beach to walk, but also was a really short 5 min drive to Kailua beach park with its bathrooms and showers and perfect low current calm beach. We went both places and loved having the pool for the afternoons after the kids napped. Hosts were great too. Made everything easy with check in and check out. We had a phenomenal vacation and the house was a big reason why. Thanks! 5 out of 5 stars Lovely home, well maintained and comfortable for a large, extended family. Management is easy to work with and quick response time to questions and concerns. Located on a busy street, however, completely fenced in for safety of children and short walk to beaches. Parking is accessible and convenient on property. 5 out of 5 stars We had a wonderful stay in this property. It's well decorated and kept in great conditions. We have 3 adult couples and 2 young children. It has everything we needed. We have plenty of public and private space. It's less than 5 minutes to the beach. The interactions with rental company have been prompt and pleasant as well. We'd love to stay in this property again. 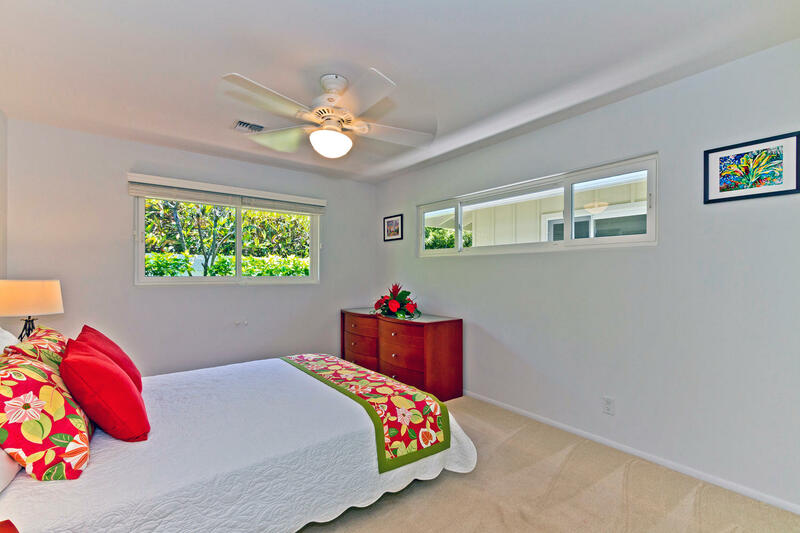 4 out of 5 stars Hale Mahina is a lovely, large home that is an easy three minute stroll to beautiful Kailua Beach. We spent a month there between Christmas and late Jan. with various family members and friends. The bedrooms offer nice privacy and the house has areas for gathering that make it great for large groups. It was nicely equipped and very comfortable. The grounds are lovely and the pool was a hit with our grandkids. All of Oahu was accessible and we spent a lot of time on the North Shore, Honolulu and Waikiki, Pearl Harbor, and at home, enjoying Kailua Town and the surrounding area, especially the beach. Highlights included an afternoon spent at the Shangri La estate, as well as Queen Emma’s Summer Palace and, of course the attractions at Pearl Harbor. Hale Mahina provided a good home base, and I can highly recommend it. 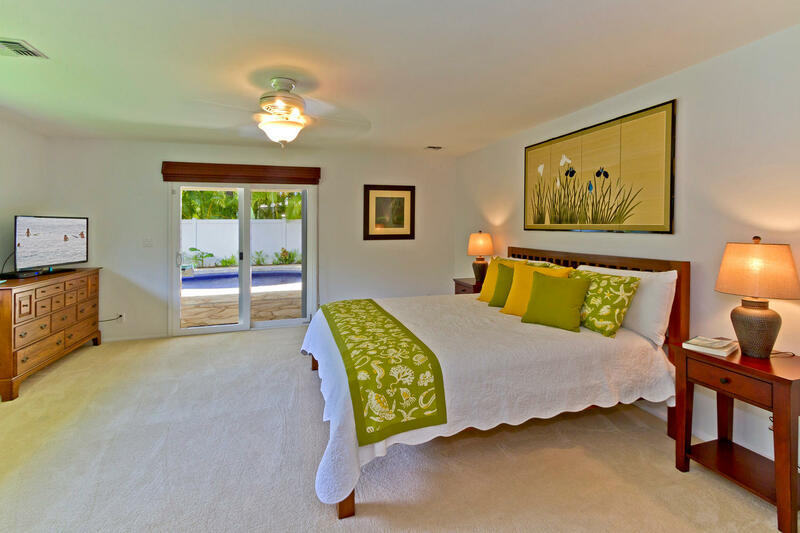 5 out of 5 stars We had a fantastic stay at this beautiful home in Kailua. We had a large family group, but the house had plenty of space for all of us, and the pool and outdoor area in particular was amazing. We loved the location just across the road from the beach. Couldn't have been better. 5 out of 5 stars There were 9 of us, 7 adults and two 5 year olds. Everything about our 7 days at this property was great. The home was exactly as advertised and the photos are good representations of the place. The home is spacious, and all 5 bedrooms (including the separate casita) were fine. The swimming pool was beautiful and we spent perhaps more time in the pool than at the beach, which was only one block away. Access to other beaches, the town of Kailua, eating options, was easy with short drives. There were absolutely no negatives, and would recommend any family that needs a 5 bedroom property stay here. The property management people were all professional, the garage had beach and pool equipment ready for use, security gates/remotes easy to use, and I could go on, but clearly this was a successful family vacation and if we decide to return to Oahu, would almost certainly again stay at this property.Our activities (not always done by all) included: Beach activities, snorkeling at Hanauma Bay, a hike of Manoa Falls, hike to the top of Diamond Head, Dole Plantation tour, Polynesian Cultural Center, eating out, eating in, and hours in the swimming pool. 4 out of 5 stars The house was in a great location and had plenty of room for us. We loved the pool and all the beach toys. The house was clean and moderately stocked. The supplies (towels, toilet paper, cups) we more allocated for 6 guests when we had 10 but they brought us more towels. They handle taking the garbage and recycling to the curb for you which is great but we only had one trash pick up in our 10 day stay with 10 people.. we ran out of room to put trash bags. The folks that run this agency are very nice and accommodating. I would recommend them amd this property to friends and family. 5 out of 5 stars A fantastic property that works well for large families. The kitchen has plenty of space for groups to cook and has all the equipment. The dinner and living areas are a great size. Bathrooms and bedrooms were perfect and had lovely linens. The pool was amazing, out four you children loved playing in it. The front driveway was wonderful for the children to play on and the property being fully fenced reduced the stress levels of all the parents! 5 out of 5 stars Great large house for a big family. Perfect location near the most beautiful beach. 2 minute walk down the street. Nice pool and a bonus cottage on the property. Staff was very accommodating and friendly. Regan made all the early helpful arrangements for us. Great location. We'll go back for another family celebration. 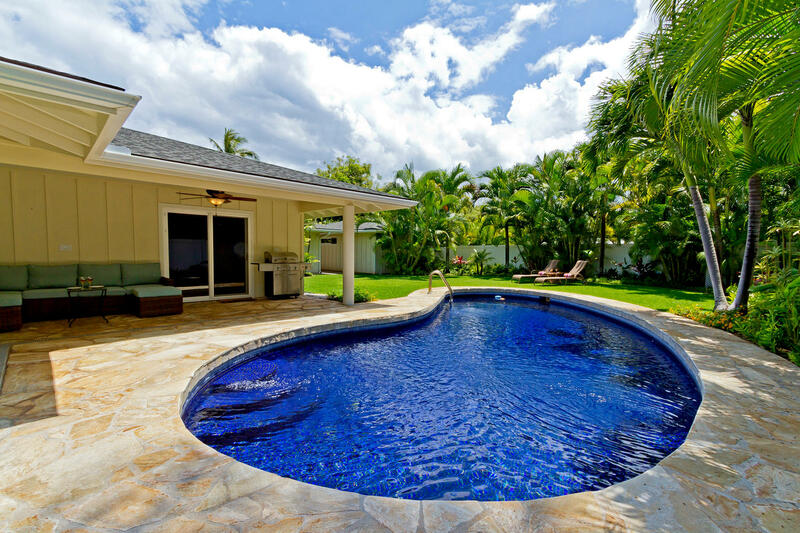 Fantastic house with beautiful pool and landscaping in Kailua! 5 out of 5 stars The Hale Mahina was a wonderful home to stay at while visiting Oahua. The location in Kailua is steps to the beach and the town has cute shops and restaurants. It is easy to access the entire island from this location and after a day at the beach, Honolulu or the North beaches, the swimming pool is a great place to land and relax! The landscaping is beautiful too! I would highly recommend this house to a large group and working with Trinity Villa Rentals made our trip hassle free! 5 out of 5 stars The house, amenities and the environment far exceeded our expectations.We enjoyed the private yard, swimming pool and proximity to the was all the website promised and more!Perfect choice for a family vacation with ages ranging between 1 and 70.Dealing with Trinity Villa Rentals was easy and perfect.We highly recommend this location and would certainly go back. 5 out of 5 stars The rental home was fabulous!!! It couldn't have worked out any better for our group of 10. We loved staying in the house, with all the bedrooms, bathrooms, wonderful kitchen, living & dining room and guest pool house. The pool was absolutely beautiful and with a short walk to the beach we had everything we wanted!The staff for Trinity Properties, especially Raegen and Alora were very professional and I would highly recommend your company to anyone looking for a rental property. Thank you for making our trip fantastic! 5 out of 5 stars 3 generations of family enjoyed this really well maintained home. Everything was super clean and in good order. The home is beautiful just as shown in the photos, and the yard is even bigger than expected. Lots of beach/pool gear available. Kitchen was well appointed, but could have been stocked with some more "basic" pantry items. We had a lovely time hanging out at the pool and walking to the nearby beach via the pedestrian path across the way. Excellent service from everyone at Trinity Vacation Rentals. We ventured all over the island with Kailua as our base. Very easy to get around from. The beaches were beautiful, although there were really strong tradewinds during our stay that brought some ManOWar jellyfish to shore that stung my nephew. We did a kayak tour with Kailua Beach Adventures that was excellent, as well as hiking, and snorkeling. The town has lots of restaurants and stores, though we did find it a little hard to find seating at some of the "highly recommended" places that would accommodate our larger family. But we did fine at the places we did dine at. The home was so nice, the only thing I noticed, was a bit of a lack of a "homey/cozy" touch, maybe some board games, etc would be nice touch. Overall, a great place. So nice to have a private place instead of a hotel. Great House in a great town! 5 out of 5 stars Very pleased with our stay at Hale Mahina which fully met our expectations. 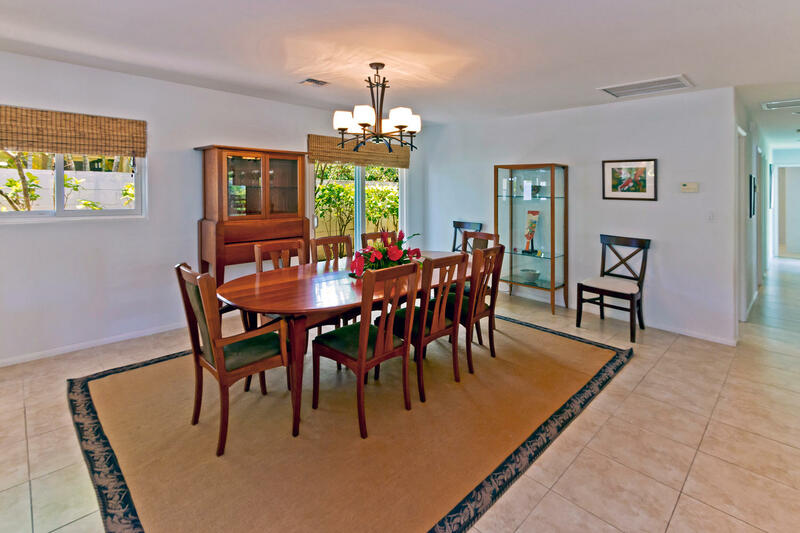 The house is perfect for 10 people, - sunny, spacious, clean, uncluttered and well equipped - loved the pool and lanai. Convenient location to walk or drive to beaches (Kailua Beach Park and Lanikai beach are amazing), town and other parts of the island. Parking was so easy and convenient - two driveway gates made getting in and out easy and safe. We would absolutely stay here again. Importantly, the folks at Trinity Properties did an excellent job of communicating with us before the trip and checking us in and out - friendy, knowledgable, honest and professional! I rarely experience such good service - most property management companies are merely adequate if not apathetic - Trinity Properties was definitely above average in all aspects. A Great Family Vacation House! 5 out of 5 stars Our family of nine thoroughly enjoyed our stay at Hale Mahina! The house and garden were spacious and beautiful. Our arrival was very smooth and the house in perfect condition. The kitchen was stocked with many more items than we expected and the fruit basket from Trinity was wonderful. Very helpful. We also appreciated the boogie boards, umbrella, and beach towels. 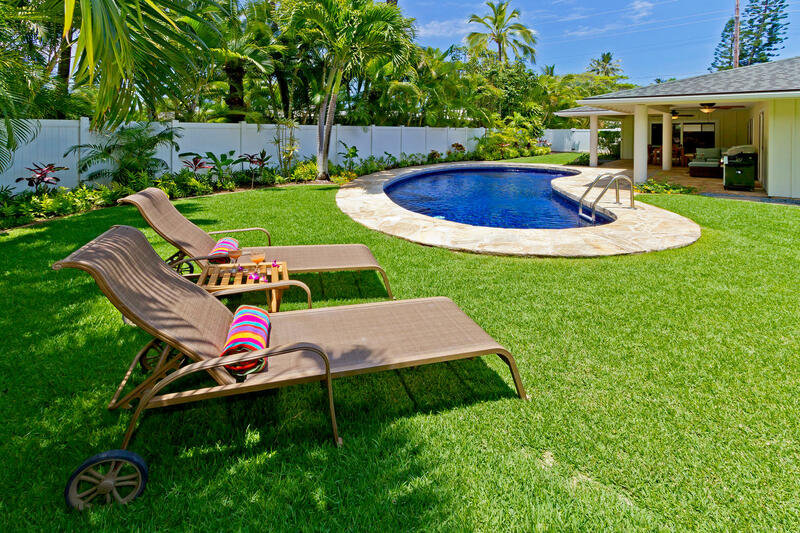 We would definitely recommend Hale Mahina and Trinity Villa Rentals to friends. Two minor comments - the guest house was very nice - but it would have been nice if they had put in a cabinet around the sink in the bathroom so there would be a place to put toiletries, etc. We were not familiar with induction cooktops and couldn't find a manual in the stack in the drawer - so we had to google it to figure out how to regulate the burners. 5 out of 5 stars We were here for a family get together prior to my son's wedding. We had a great time in this nice, very spacious, clean home. It was very inviting with the amenities including the clean swimming pool and well stocked large kitchen. We also appreciated the basket of fruit provided by the owner. Trinity management responded to our requests promptly. 5 out of 5 stars We had a great holiday in Hale Mahina. There were 10 of us plus two kids and there were plenty of room for all of us. Trinity Properties staff were really helpful and we got answers to our questions quickly. They were professionals! Property location was perfect, we rented cars and made trips around island, It took about 35min to Honolulu by car, location had also easy access to highways. We also took a bus to Honolulu, bus stop was close and traveling by bus was really easy.Property was really well maintained, also the amenities (kitchen stuff, laundry, pool, towels and sheets, air condition etc.) were top.After all we had a memorable and great holiday in hale Mahina and Hawaii. Hale Mahina, a beautiful home! 5 out of 5 stars This home was awesome! The pictures do not do it justice. It's much bigger in person. We had 3 families totaling 10 adults with plenty of space. We enjoyed the use of the pool and we were only 2 blocks from the beach. The home was equipped with almost everything needed for our stay. Beach towels, beach chairs and boogie boards. 5 out of 5 stars This property was perfect for our family get together ! We had 9 adults and 3 children under 3 years of age. The house is nice and open...plenty of room for everyone...Since one family in our group had a new baby, the cottage worked out perfectly for them, so they could have their needed privacy, but yet still be part of the group. The kitchen is well stocked with not only plenty of dishes, cooking utensils, pans, and storage containers but also all kinds of spices ...nice dining area with a table big enough for everyone to sit comfortably. Rooms and bathrooms were clean and comfortable. They provided large size shampoo, conditioner and body wash in each bathroom which was a really nice touch. 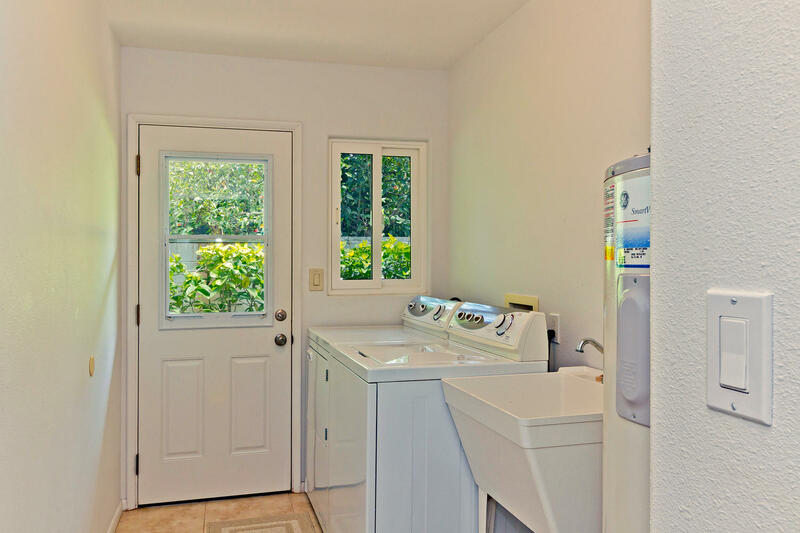 There was a nice washer and dryer which our group used daily.... the property provided plenty of laundry soap. The pool and outside patio couldn't have been nicer...plenty of comfortable furniture and lounge chairs to relax on...a great BBQ. The beautiful beach is just a few minutes away...easy access across the street. The beach was nice and clean..not crowded...fun body surfing waves. There were plenty of beach towels, boogie boards, beach chairs and an umbrella as well as beach toys for the kids : )The property has a big two car garage and is behind it own private gate, so we felt very safe. We had to rent some baby equipment for the kids and Trinity Properties referred us to a great company that they work with...they arrived at the same time we did to the property and set everything up for us. Likewise, on the day we left, they came and picked everything up...very prompt and courteous. Overall, we had a great time. We would highly recommend renting this property and would definitely consider renting it again. Terrific Home Near the Beach! 5 out of 5 stars We stayed here for 7 nights in July/2015 for a family vacation. Upon arrival we were immediately impressed with the location and overall condition of the home. The home is immaculately clean and the yard/garden/pool was like a tropical paradise. I read some reviews about the pool being cool but it was quite warm in July. The home stocked with a few basic supplies (cleaning, paper, etc.) but there isn't much as far as food preparation (salt, pepper, oil, etc.). This was fine as there's a Safeway a couple blocks away. Beach access is great and the beach is quite nice and not crowded at all. Customer service from management company was superb from the booking process up through departure. Response was generally within a couple hours and always very friendly. We'd definitely stay here again! 5 out of 5 stars This property was wonderful. 9 people, 3 children under the age of 10. Plenty of room, very well appointed, very clean, lovely furnishings, beautiful pool. Beach across the street. Gated and safe, quiet although on a busy street. Cooked for 9-12 people many nights. Trinity staff very attentive. Would come here again in a minute. My grandson, age 10 did not want to leave. 4 out of 5 stars could have used more towels, with ten people we were washing them quite frequently. we would have appreciated portable privacy screens when using the room by the front door for a bedroom. we appreciated the beach chairs, beach towels, and ice chests. this place was great! 5 out of 5 stars We are repeat visitors to Kailua and love the small town in which you can still mix with the locals. Hale Mahina was a great fit for our family of three grandparents, two parents, and three children. Well maintained, nice amenities including boogie boards and other beach stuff, easy access to the less crowded end of the beautiful Kailua beach, even spare batteries, lightbulbs and bandaids! We'll definitely ask for this house again on our next visit. We were able to surf, snorkel, see some sea turtles and walk the beach for hours. And then come back for a beverage and either sit on the outside couch or relax in the pool. 5 out of 5 stars The location of this house is perfect, across the street from the beautiful Lanikai Beach. The house was very comfortable and we enjoyed our stay. Would absolutely stay here again! 5 out of 5 stars We were a family of 11 adults and 1 baby and we had a great experience at the house. The place is very well equipped and very close to the beach. Highly recommended for large families or groups. 5 out of 5 stars We had an absolute ball in Kailua at Hale Mahina! We had a group of family andfriends who each had their own privacy and space but the house had a wonderful common area we all could enjoy together. The short walk to the beach enabled us to swim in the ocean several times daily and the pool at the house was lovely as well. A fantastic time was had by all! 4 out of 5 stars This house perfectly accommodated 3 young family's. The kitchen and pool were wonderful, and the nearby beach is world class. We will be back! New low rate of $795/not NOW THRU JUNE 6th, 2019!